Center- Chris Choate & Cheryl Woods, Liberty Lake, WA with Darrel Choate and Nikki Naiser from the Bozeman Rotary clubs. 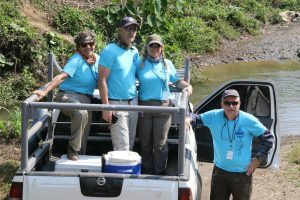 My father-in-law has been working with PWW for over a decade on water projects in Honduras, initially through his church and ultimately via his Rotary club. He instilled in us a respect for the importance of clean water, and more specifically, clean water in remote Honduran communities. Thus, the desire to want to be a part of the same was born. It was because of him that we took this leap and embarked on our recent trip to Honduras. I’ve read blogs and testimonials of other PWW volunteers and the same words continue to be prevalent; “humbling” and “life changing.” If I were tasked to choose only a few words to describe the experience on my recent trip, those words would just give you a small taste of what a person takes away from this trip. This trip inspired us to return to our local club and share what we had seen and the work we had done in this, our newfound passion. Our hope was to inspire other members to want to be a part of this cause. Upon our return, we offered up a presentation to our club; having the photos to share, the stories and experiences fresh in our minds, the bruises and aching muscles still evident. We shared the experience from our hearts. We then followed up with a quick auction, offering up several 2pks of Cubanos that were gifted to us on our cigar factory tour in Danli, Honduras at the end of our trip. We didn’t ask for any specific dollar amounts but I did tell our membership that I had pledged to send back to PWW any money received for the cigars. In the span of about 3 minutes, we raised $310.00 to go towards a “tool fund” for PWW. I proudly forwarded a check to PWW just a few days later and almost immediately was referred to as a “PWW Ambassador.” Such a gratifying feeling. This is the feeling that Chris and I had been searching for. Since we shared our story, several members of our Rotary Club have expressed a desire to be a part of this amazing program and accompany us on our next trip. We hav e yet to decide on our next date, but are hoping to fill a trip for Spring or Fall of 2018. With the help of social media, Chris’s photos were seen by another Rotary club in Idaho whereupon they immediately requested he share his story with them. Once again, it didn’t take much for them to be inspired and express interest in this worthy cause. Thank you so much Pure Water for the World, for our experiences, for making a difference in the lives of so many, and for giving hope for a healthy life for so many people in need. Thank you so much, Cheryl, for joining us in Honduras and making a difference! We are grateful to have you as part of the PWW family! To learn more about our impactful, hands-on trips, click here. PWW Travelers Honduras, PWW Travelers, PWW Trips, PWW Volunteers, volunteer, volunteer for good. permalink.